Although nanostructured ferritic alloys (NFAs) have excellent potential for nuclear reactor applications, they have limited formability. Compared to austenitic steels that can reach a maximum uniform elongation of 30% at 200°C before necking occurs, NFAs are limited to 5-7%, which makes fabrication of components difficult. This is a major shortcoming since reactor applications often require complex or difficult-to-fabricate forms, such as thin-walled tubing commonly used for cladding. To overcome this drawback, we are investigating electrically-assisted (EA) deformation as an approach to significantly improve the manufacturability and commercial viability of NFAs. 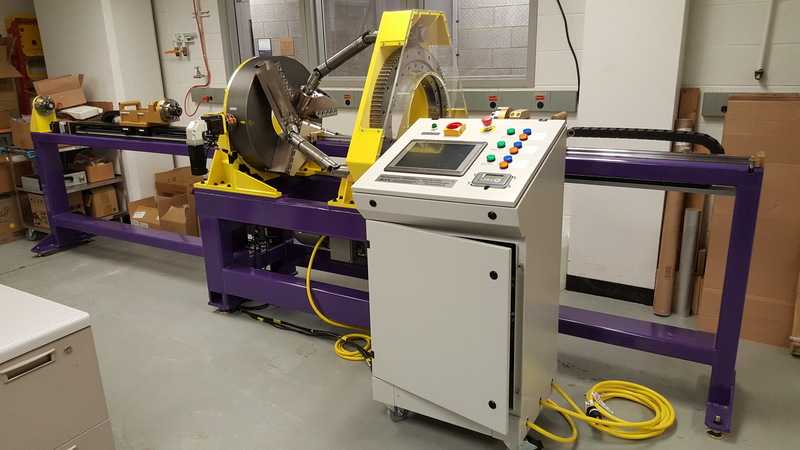 Our goal is to at least double the current amount of uniform elongation of NFAs through the EA process to reduce the manufacturing cost and to increase the performance of this promising class of materials for cladding applications. Electrically-assisted (EA) forming is a process that uses electric currents to ease the deformation of the workpiece by reducing the flow stress of the workpiece material. 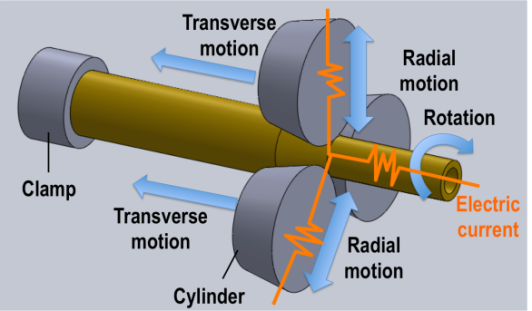 This process can provide a localized effect by passing current only through the region of interest. 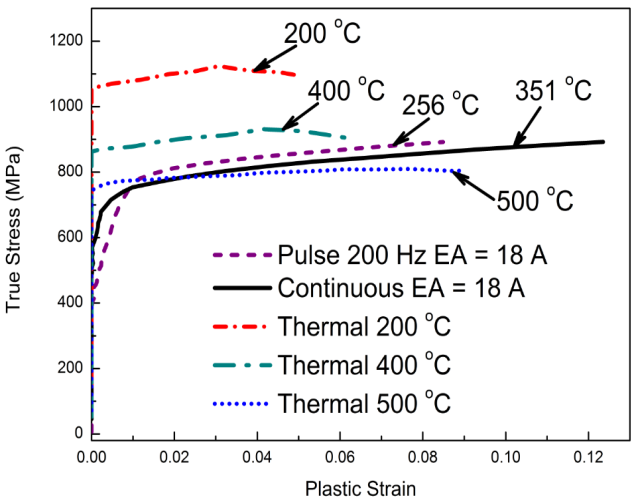 The reduction of flow stress in an EA process is attributed to thermal and athermal effects of electric current passage. We are establishing innovative electrically-assisted tube forming processes to reduce the forming and annealing steps needed for making thin-walled claddings made of high-strength NFAs, and hence, significantly lower manufacturing cost and maintain desired microstructures. This work will improve understanding of the effect of pulsed and constant electric current on crystal structure and material properties during the plastic deformation. Meanwhile, a new manufacturing design for best practices for EA forming equipment will be developed, and the related parameters for novel EA forming processes can be established. The logical path of the research is shown in Figure 1. To investigate the formability and the resulting performance in service and to demonstrate the applicability and scalability of the EA process, the related work includes: (1) Mechanical characterization of NFA coupon specimens in EA forming; (2) Demonstration and process mechanics of EA tube forming; and (3) Microstructural characterization of EA formed samples. Some preliminary work on one nanostructured ferritic alloy, 14YWT, was conducted and shown in Figure 2, where the material was subjected to either continuous or pulsed currents. The results are compared with standard tensile tests performed at elevated temperatures in an inert gas furnace. An EA tubing process and conceptual incremental tubing machine design as illustrated in Figure 3, is proposed to demonstrate the feasibility of producing long tubes (up to 1 m) for reactor applications.